The hypoblast is a thin monolayer of small cuboidal cells that make up the lower layer of the bilaminar embryonic disc. This layer can be distinguished from the overlying epiblast in the mouse embryo as early as day 4.5, and day 7 in human). 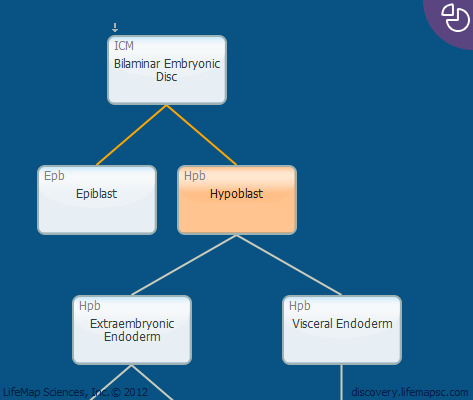 The cells of the hypoblast are not thought to contribute to the developing embryo proper, but contribute to several extraembryonic structures. In rodents, the hypoblast cells form the parietal endoderm, parietal and visceral yolk sac as well as extraembryonic membranes, such as the extraembryonic endoderm, the yolk sac and the stalk that links it to the endodermal digestive tube. In human embryos, hypoblast cells migrate and line the blastoceolic cavity of the blastocyst, forming the primary yolk sac and Heuser's membrane. Although both the murine perietal yolk sac and the human primary yolk sac are transient structures, they are not developmental equivalents. A second wave of hypoblast cells migrates to form the definitive yolk sac which displaces the primary yolk sac and is equivalent to the murine visceral yolk sac. The primary yolk sac breaks up into small vesicles that can persist at the mural (abembryonic) pole.